Over three decades, MEA leaders, staff, and members have raised $443,586 to bring holiday cheer to families in need. This year, the event provided cash donations to dozens of charities across Michigan and purchased food and gifts for 52 families in need who were identified by Volunteers of America – Lansing. However, MEA’s holiday giving is not confined to headquarters. School employees who belong to local MEA units all over Michigan regularly conduct their own charitable events. The Battle Creek Education Association has been holding their annual Sock and a Buck drive for many years at Battle Creek Public Schools. 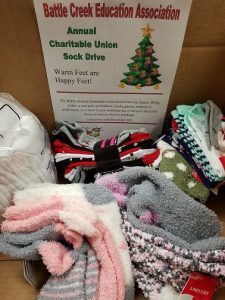 Each building in the district, coordinated by union representatives, collects new socks and or a monetary donation that goes to the Charitable Union in Battle Creek, which supplies clothes to thousands of local families. The BCEA usually collects hundreds of socks and hundreds of dollars every year to help families in need. In Cadillac, members of both the district’s local associations have worked with a community group called “Project Christmas” for the past five years. Families in need from the community apply to participate in a free gift event at Wexford Arena. The families shop for free Christmas gifts from a shopping list based on their family size. The event is filled with tables of giveaways – everything from pet items to toys and clothes. The Cadillac union members fill and staff a book table at Project Christmas and also volunteer at tables throughout the arena. 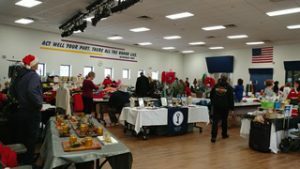 The Farmington Transportation Association held a Holiday Craft & Vendor Boutique to raise money for C.A.R.E.S. of Farmington Hills, a food pantry that serves Oakland County. Table fees, raffle tickets, and a bake sale combined to raise $1,700 for the non-profit organization. The Dec. 9 event at East Middle School featured 40 crafter/vendors. “We had to turn several others away, because we had no more room!” said Jill McRoberts, local president. Education Associations in Grosse Pointe North and South have been doing an Adopt a Family program for years. They adopt anywhere from 75 to 100 families in the community. They also do coat drives and many other charitable events in November and December. 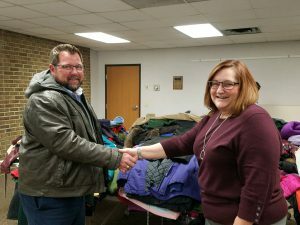 This year the Lansing Schools Education Association held a winter coat drive for the fifth year, giving out more than 100 coats plus additional items of need to nearly 200 PreK-12 students in the district. LSEA members at each school identify items and sizes needed, which are matched up with donated items or purchased through donated funds. The orders are arranged by LSEA staff and LSEA-Retired members and delivered to individual buildings. LSEA members want to ensure that students travel to and from school in safety and warmth, according to LSEA President Chuck Alberts. “In Lansing, we have an ever-growing refugee population and often times winter clothing is an essential they do not have,” Alberts said. The association representing Lansing secretaries adopted a local family with two students in the district to purchase holiday gifts from the children’s handwritten Christmas lists. 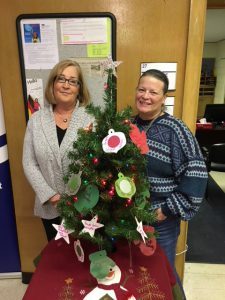 Members of the local took ornaments listing the kids’ wishes from a Christmas tree that union leaders placed in the school district’s Welcome Center office. Items on the girl’s list included clothing and makeup, while her younger brother was requesting toys and games. Members of the Linden support staff unit comprising Custodial, Food Services, Maintenance, and Paraeducator employees every year fulfill the holiday wishes and needs of children whose names are hung on Christmas giving trees in local grocery and hardware stores. Through the Linden CFMP members’ donations, children receive coats, socks, underwear, snow pants, toys, candy, and more. The union members choose tags from the tree, purchase the items, wrap them, and deliver to the children. 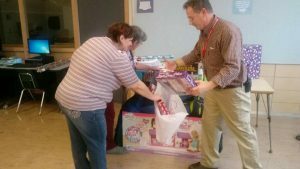 The Muskegon Clerical/Classroom Assistants Association, the local MEA/ ESP group from Muskegon, is gifting a struggling family with a complete Christmas Dinner and some presents under the tree on Christmas morning. The family they’re helping consists of a mother and two children, 9 and 11, who do not receive any state or federal assistance but struggle to make ends meet and stay above the poverty line, according to Jim Webber, MCCAA president. “We live, teach, and celebrate in our own communities with the families we provide services for,” Webber said. Support staff in Novi Community School District organized their first food drive this year to benefit Lighthouse of Oakland County – delivering six large boxes and eight grocery bags full of goods to help feed hungry families in the area. 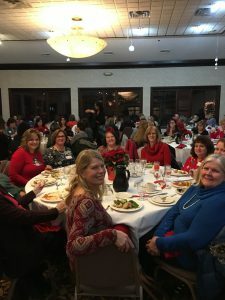 The Novi Educational Support Personnel Association conducted the 16-day drive and plans to continue supporting Lighthouse and Haven of Oakland County throughout the year, according to Sandy Brasil, Novi ESP president. The Southfield Goodfellows and the Southfield Education Association have been fulfilling holiday dreams for children in Southfield and Lathrup Village for more than 50 years. The Goodfellows find needy families in the community and distribute Giving Tree Tags to teachers listing the first name, age, and gift suggestions. The teachers and staff at each building fulfill as many wishes as possible – typically 65-80. This project is dear to teachers and staff because they are fulfilling the holiday dreams of the children they see in classrooms every day, according to SEA President David Raether. Gifts purchased include practical items such as coats, hats, and boots – but also books, toys, bikes, iPads, phones, computers, and beds. 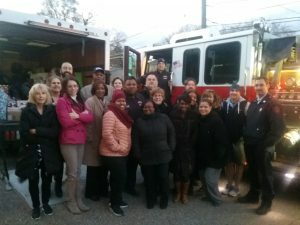 The Southfield Fire Department also contributes by delivering the gifts in a fire truck decorated as a sleigh. “It is truly a community effort, making sure that every child in Southfield and Lathrup Village has a bright and happy holiday,” Raether said. A craft and bake sale, combined with a silent auction, helped support staff at St. Clair Community College raise $1,000 to help a local charity and to build a scholarship fund for students at the college. Half of the money went to a local shelter for families, A New Dawn, and half went to the scholarship fund. Earlier in the month, members of the unit also participated in an Adopt-a-Platoon event by donating 25 stockings filled with food, snacks, toiletries, books, and other goodies for active-duty military personnel. “This is a great group that gives back to the community all the time,” said Leslie Knope, MEA field organizer. Support staff in Three Rivers Community Schools conducted a canned goods drive for donation to a local food bank, after adopting a family to help for Thanksgiving. “These are two of several community service projects this ESP unit has done,” said Dorian Prier, MEA UniServ director. The 300 members of the Utica Para Professionals Association (UPPA) raised more than $2,800 to benefit two local charities in this year’s ninth annual Christmas celebration, where more than 70 gifts donated by members were given away in a raffle drawing. All proceeds benefited the Macomb County Veterans Food Bank and Turning Point, a shelter for battered women. “Over the years, this event has gotten bigger and bigger, so this year we needed a bigger venue!” said Antonella Piccirilli, UPPA president.